The Marion Springs School is significant for its association with rural school consolidation in Douglas County. The Marion Springs School has the characteristics of a Country School, specifically the Country Two- (or more) Teacher Consolidated School sub-type. 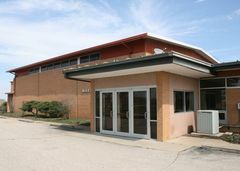 The school’s location in rural Douglas County also fits well with the description of a Country School, as these schools were typically built on section corners at two-mile intervals reflecting the walking distance of children. 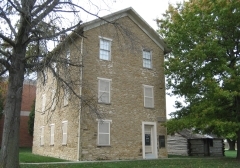 Consolidated schools were located in rural communities and were often the first move to a graded school system from earlier one-teacher schoolhouses. The building is also significant for its association with architect Joseph Radotinsky as an example of the Modern Movement style. The school was incorporated into the Baldwin City school district in 1966. National Register listing is pending. 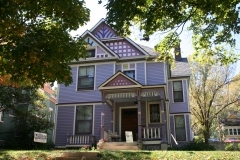 The Handel T. Martin house, built in 1917, is located in the University Place neighborhood on the south slope of Mount Oread in Lawrence. 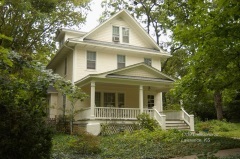 The residence is a well-preserved example of the American Foursquare, a house type commonly found in early 20th century neighborhoods in Lawrence. It features typical Classical and Colonial Revival embellishments. Martin was a long-time employee of the University of Kansas, working as an instructor and a curator at the Natural History Museum from 1912 to 1931. He was an early fossil collector and contributor to the emerging field of vertebrate paleontology in the late 19th and early 20th centuries. Martin partnered with KU archeologist T. R. Overton to excavate the highly significant Twelve Mile Creek site in Logan County, Kansas in 1895, an excavation considered to be the first systematically excavated Paleoindian site. Martin lived in this residence south of campus until his death in 1931. 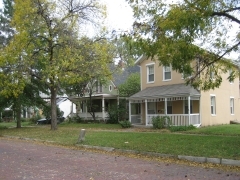 It is nominated as part of the "Historic Resources of Lawrence, Douglas County, Kansas" multiple property nomination for its association with Martin and its local significance in the area of architecture. 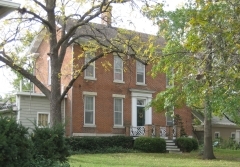 The Mugan-Olmsted House is significant as an example of a residence that evolved during development patterns associated with the growth of Lawrence between 1866 and 1956. Patrick Mugan, a trained stonemason, built the first portion of the house around 1866 as a gable-front dwelling. The house was soon expanded, taking on a gable-front-and-wing form. 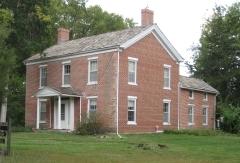 This form was a common building type in the mid-1800s and the two-story version was mostly popular in the northeastern and midwestern states. The Mugan-Olmsted House is atypical in this form due to its construction of stone rather than wood, which was more common. The house continued to change through its ownership by the Mugan and Olmsted families, acquiring a front porch, south sunporch, interior bathrooms, and millwork. 700-1144, 901-1047, 1201-1215 Rhode Island St. The property was settled by John and Anna O'Sullivan in 1866 and was developed into a successful family operated cattle and livestock farm. 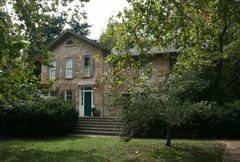 The property has been continuously owned and operated as a family farm by descendants of the O'Sullivans. The farmstead is a cohesive collection of farm and rural residential-related structures that demonstrate development-over-time by reflecting the resources and values of a single family over multiple generations, and by incorporating technological changes into the architectural fabric. 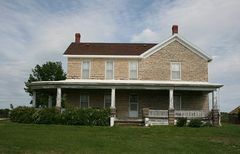 The buildings are significant as they convey the feeling and association of a historic Marion Township, Douglas County, Kansas farmstead. Oak Hill Cemetery was incorporated during a critical moment of identity for the City of Lawrence, Kansas. Still reeling from Quantrill’s Raid, which destroyed much of the fledgling city in 1863, Oak Hill was founded in part to act as a memorial to the citizens killed in the Raid and in part to establish Lawrence as a settled and sophisticated city on the edge of America’s frontier. Oak Hill is significant both for its connection to the Civil War, Bleeding Kansas, and Quantrill’s Raid and for its place in the urban development of Lawrence, Kansas. Furthermore, as a designed public landscape, majorly attributable to the single hand of Holland Wheeler, an important figure in the development of Lawrence, Oak Hill is a masterful example of Rural Cemetery design in the Midwest.